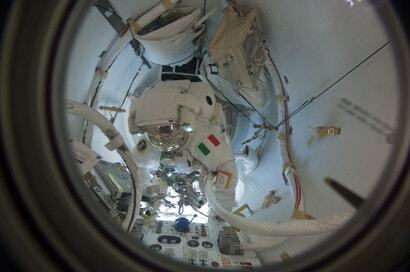 Italian astronaut Luca Parmitano is sitting out a scheduled spacewalk on Tuesday after the crew found water leaking "inexplicably" into his helmet. While NASA stopped short of explaining the situation beyond that, Commander Chris Hadfield said quite simply that the spacewalk from the International Space Station (ISS) was aborted "to be safe" and added that it was a "good idea". Parmitano had been scheduled to make the spacewalk with fellow ISS flight engineer Chris Cassidy to finish the installation of some bypass jumpers in what would've been the fifth space walk this year. And as you might imagine, Parmitano was not thrilled about the change of plans, especially after he put on the suit. "He looks fine," the crew said of Parmitano as they brought the spacewalk to a formal end to the spacewalk. "He looks miserable but OK." The ongoing feed from the ISS is below.